Facebook’s new Instant Games platform is as much about reorienting its social empire back toward gaming as much as it is cutting out the mobile apps that have threatened its hegemony on phones and tablets. The new Instant Games platform, launched Tuesday, is an HTML5-based gaming platform that eliminates the need to download the recent Facebook Gameroom app. Seventeen games—including arcade classics as Space Invaders and Pac-Man as well as more modern games like EverWing and Words with Friends: Frenzy — can now be launched directly from your News Feed, rather than forcing users to dig them out from the left-hand sidebar. More importantly, in-app games can now be launched within both the Facebook mobile apps as well as Messenger—again, without the need to launch separate apps. An Instant Games leaderboard within Facebook Messenger. On Messenger, a new game controller icon will appear just below the box where users can type a message. If your buddy brags about his high score in Pac-Man, you’ll be able to see how you stack up via a shared leaderboard. Meanwhile, an “Instant Play” button will allow you to launch the game to see if you can do better. It all looks like an embedded ad, though. All you need is a phone with either iOS 8 or higher, or Android 5.0 (“Lollipop”) or higher. It’s available in 30 countries, Facebook said. Some Facebook apps are leaving Facebook entirely for mobile platforms. Why this matters: Today, “Facebook gaming” might refer to Facebook’s nascent push toward livestreaming games like Overwatch or college basketball games on Facebook Live. Six years ago, however, Facebook practically launched social sharing games like Zynga’s Farmville. As Zynga rose, and then fell, it and other developers expanded into dedicated mobile apps and away from Facebook. 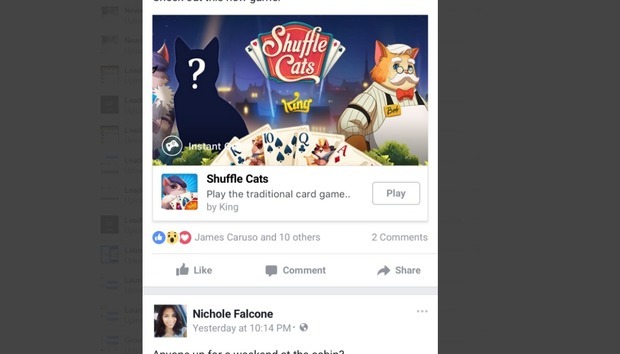 Today opening the Facebook mobile app’s menu and selecting “Games” will push you to your smartphone’s app store—revenue that flows to the app developers themselves, not Facebook. Meanwhile, developers like Apple began to realize that their own messaging apps were actually a platform. You can now play Words with Friends within the iMessage app on iOS 10, and more games are coming as part of a dedicated iMessage app store. You’ll be able to challenge Facebook friends without leaving the app, too. Instant Gaming is designed to reverse these trends. Leo Olebe, the head of global gaming partnerships at Facebook, said that 15 percent of the total time its more than 1.79 billion users spend on Facebook is spent playing games. In 2015, the company paid out $2.5 billion in fees to developers. “The idea that there’s not a lot of gaming business on Facebook.com is incorrect,” he said. According to Olebe, Gameroom hosts titles that are written on the Unity platform: “midcore experiences with higher fidelity,” he said in an interview. As the name Instant Games suggests, the new platform is about a quick access and play experience, he said, complementing Gameroom. What’s not exactly clear is how sophisticated Instant Games will actually be. Facebook hasn’t publicly set minimum hardware requirements for the new apps. So far, however, it’s probably not too far-fetched to suggest that a game like Pac-Man will run on pretty much any smartphone under the sun. With over a billion users running Messenger, that’s probably good enough for Facebook.